If some folks do have concern about crime rates in Bellevue, it doesn't seem to be because they're on the rise. Yes, there’s crime in Bellevue, too. I’ve been alerted to that fact by Seattle Times readers. I’ve written a lot about crime in Seattle — property crime, in particular — because it’s an issue for many people who live in the city. Readers on the other side of the lake have asked for similar attention paid to the problem over there. Bellevue, of course, has a reputation as a very safe city — at least in comparison with Seattle. Crime statistics bear that out. I used preliminary police-department data and population numbers from the Washington Office of Financial Management to calculate the crime rates for 2018. In every major category of crime, the rates are lower in King County’s second-biggest city than in Seattle. Some of the differences are pretty dramatic. You’re six times more likely to be the victim of an aggravated assault in Seattle than in Bellevue, and the rates of robbery and burglary are more than twice as high in the Emerald City. 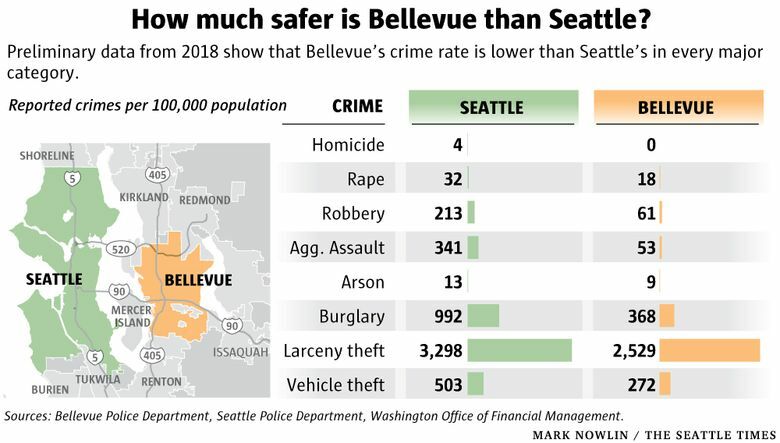 Even so, I’m not surprised to hear complaints about safety from folks over in Bellevue, because when it comes to something as frightening as crime, statistics don’t always matter. “There’s a thing you may be familiar with called the ‘Nextdoor effect,’ ” said Seth Tyler, spokesman for the Bellevue Police Department. Tyler is referring to the hyperlocal website and social-media platform, Nextdoor.com. It provides a forum for neighbors to communicate privately with each other and to share information. But folks frequently use the site to post about crime or any (real or perceived) suspicious activity. Neighbors who spend a lot of time reading these posts can come away with a heightened sense of fear and the feeling that things in their neighborhood have gotten out of control. In a column last summer, I wrote about this phenomenon in some lower-crime Seattle neighborhoods. Eventually, an alarmed resident winds up contacting the Police Department or the City Council, wondering why nobody is doing anything about a crime wave that’s, in reality, one or two isolated incidents, he said. But he adds that the city conducts an annual survey of residents’ perceptions of crime and safety, and that the vast majority say they feel Bellevue is safe and that they have a lot of confidence in the Police Department. One of the perennial complaints here in Seattle is about police response times to nonemergency calls. A lot of people say they’ve given up reporting property crimes because of it. In Bellevue, apparently, this issue does not exist. Even for low-priority crimes, the response times are short, Tyler says. And if, for some reason, there is going to be a delay, they will call to let you know. Like in Seattle, many types of nonemergency crimes can be reported online in Bellevue. If some folks do have concern about crime rates in Bellevue, it doesn’t seem to be because they’re on the rise. For the most part, crime in Bellevue has been pretty steady over the past five years. There are some exceptions. Last year, for example, vehicle theft saw a 17 percent jump. Even so, the rate remains much lower than it was a couple decades ago. “If you look back at auto theft in the early 2000s, we were having 700 to 800 cars stolen a year. Now we’re down to 300 to 400,” Tyler said. He attributes the decline to an auto-theft task force formed by the Bellevue police, as well as improved anti-theft technology in newer cars. Another major crime category that has been trending downward is burglaries, and in particular, residential burglaries. Tyler thinks a contributing factor to that is the introduction of home-surveillance systems, which are a more effective deterrent than older alarm systems. But a bit concerning, perhaps, is an increased in two types of violent crime last year: robberies (up 48 percent) and aggravated assault (up 17 percent). That could just be growing pains, Tyler says. 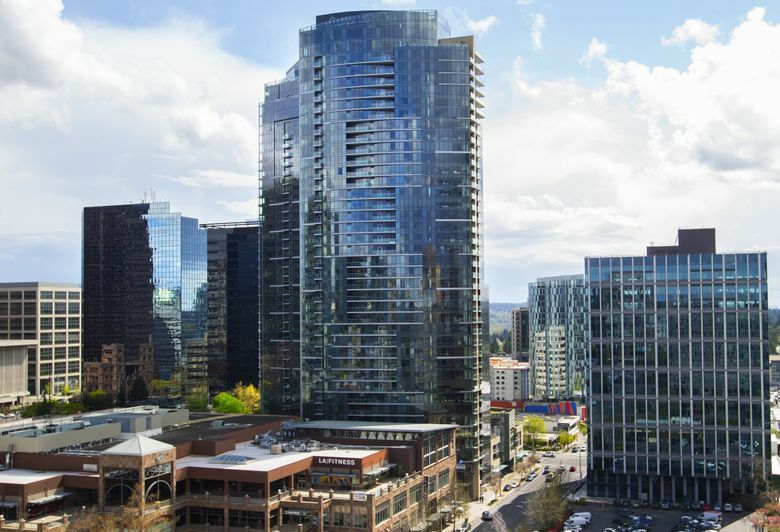 Bellevue isn’t a sleepy suburb anymore, and they’re starting to see some issues you’d expect in any larger city.